Nearly 77 million U.S. households had some type of formal, tax-advantaged retirement savings in the first half of 2017, according to updated Investment Company Institute (ICI) data. For 26 percent of all households their old-age financial coverage was strictly employer-sponsored in H1, i.e. current/expected defined benefit (DB) plan payments, or defined contribution (DC) plan balances. Thirty-five percent of U.S. households had individual retirement accounts (IRAs) during the first six months of 2017, among which more than eight in ten also had employer-sponsored plans. That latter group of Americans will likely be the best prepared for a comfortable and financially secure retirement because they are making use of multiple tax-advantaged savings vehicles. This is especially true for those individuals who remain consistent participants in all of their retirement plans. Indeed, in October we learned that ongoing participation in a 401(k) plan can generate significantly greater growth over time, and an earlier study by the Employee Benefit Research Institute (EBRI) suggests that the same holds true for IRAs. Specifically, the average account balance among all IRA owners in the sample rose from $91,864 in 2010 to $127,583 in 2014 (most recent data), a solid 38.9 percent increase. However, the average balance for individuals who continuously owned IRAs lifted from $92,087 in 2010 to $134,244 in 2014, a 45.8 percent gain. Those results should not be too surprising since growth in both 401(k) and IRA balances is ultimately driven by a combination of plan contributions and investment returns, and consistent participation in such plans therefore means a steadier stream of contributions as well as a higher likelihood of benefiting from rallies in the stock market. That last point is crucial because some of the best gains in equities can often occur over very short time horizons. For example, the S&P 500 rose 9.54 percent in 2016 but the bulk of this increase occurred in the weeks immediately following the Presidential election. Any investors who “sold in May and went away,” for instance, would not have benefited from that substantial year-end rally. Similarly, J.P. Morgan estimated that $10,000 invested in the S&P 500 at the start of 1997 would have been worth $43,933 at the end of last year. 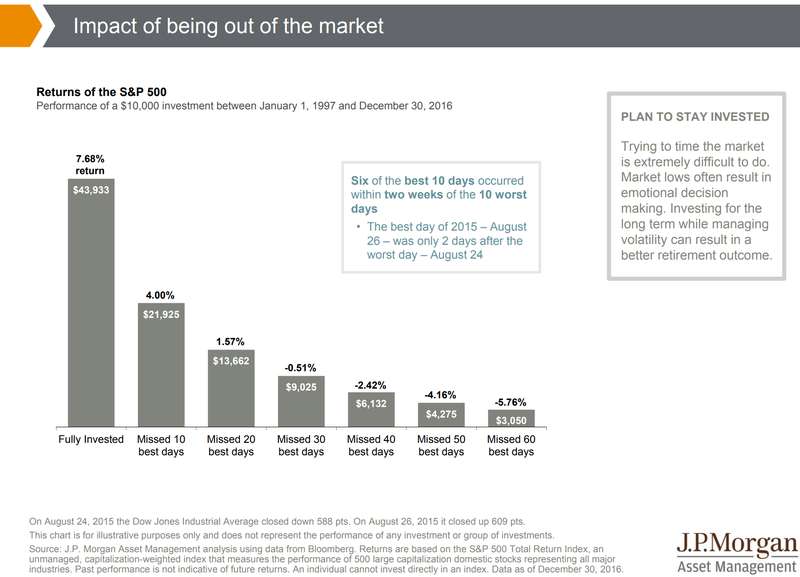 However, missing out on only the 10 best performing days in the market during that period would have slashed the ending portfolio value roughly in half ($21,925), and not participating in the 60 best days would have actually resulted in a loss over the two-decade horizon. Continuous participation, though, can at times be challenging, e.g. during heightened stock market volatility or when unexpected money troubles force people to dip into their retirement assets early. This is why consulting with a professional financial advisor in such situations can help individuals determine all of their available options and ensure that the decision they make is optimal for both their near- and long-term financial well-being.